So, we decided to spread our wings to places further off the canal path. We took one of the buses that pass through several times a day into Lichfield and spent many hours over two days exploring this medieval city. As we were waiting for our motorized transport we got a chance to see a local couple enjoying an earlier form of transport. Lichfield began as the sight of a first century Roman fort. When St. Chad died in 672 AD a shrine to him was created and Lichfield became a religious center attracting pilgrims. When Henry VIII broke with Rome the reprocussions were felt in Lichfield. The destruction of St Chad's shrine in 1538 meant the end of the religious pilgrims that had traveled to the shrine. That year the Franciscan Friary in Lichfield was also dissolved and the land and buildings moved into private hands. built between 1195 and 1249. 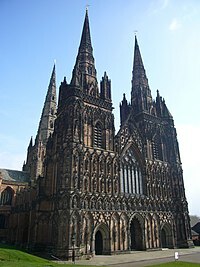 The first thing everyone MUST do is go to see Lichfield Cathedral. It is the only medieval cathedral in Europe that has three spires. Each spire represents one part of the Holy Trinity: Father, Son and Holy Spirit. The present building was started in 1195, and completed in 1249. Fifty four years to build a church so it would withstand the test of time. It replaced a Norman building which had replaced one, or possibly two, Saxon buildings. Above is a notice still found as you enter the cathedral grounds. A bit humorous in today's world but helpful if you just happen to be taking your cows or oxen somewhere. Excavated in 2003and housed in the cathedral, the Lichfield Angel is a high quality carved limestone panel, which has been dated to around 800 A.D., and is thought to have formed the corner of a shrine chest, possibly that of St Chad. The carving depicts an angel, his right hand raised in blessing and the left bearing a leaf shaped/leaf decorated sceptre. Also on display in the cathedral are the St. Chad Gospels,dated from about the year 730 AD making it slightly older than the Book of Kells. The book is a beautiful hand illuminated copy of the Gospels of Matthew and Mark, and the early part of the Gospel of Luke. A second volume disappeared about the time of the English Civil War when the cathedral's library was plundered.Written in Latin, the manuscript has added importance due to notes in the margins of pages written in Old Welsh. These notes are the earliest known example of written Old Welsh yet discovered and date to the early part of the 8th century. It is believed the Gospels were created to become a part of the Shrine of St. Chad. 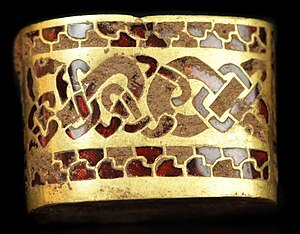 The Staffordshire Hoard, discovered in a field near Lichfield, is made up of over 3,500 items that have tentatively been dated to the 7th or 8th centurary in the time of the Anglo-Saxon Kingdom of Mercia placing the origin of the items in the time of the Anglo-Saxon. It is assumed that the items were buried by their owners at a time of danger with the intention of later coming back and recovering them. The quality of the workmanship is extremely high The hoard has been valued at over £3.285 million. 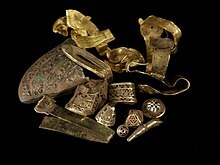 The cathedral displays reproductions of some of the pieces in the Staffordshire Hoard. Above are gold fittings, still waiting to be cleaned, three of which have both gold and garnet. Above is a sword fitting with garnet. Lichfield was the birthplace of Samuel Johnson and the house is now a museum with period room settings showing how Johnson, who wrote the first English dictionary, would have lived there. Charles Darwin's grandfather, Erasmus Darwin, also resided in Lichfield. Erasmus was a physician, scientist, botanist (with a sizeable herb garden), inventor and poet. It is easy to see who Charles took after. David Garrick, a famous 18th century actor, playwright, producer and theater manager hailed from Lichfield and the city's community theater bears his name. Moving on to more modern times, Commander Smith, the ill fated captain of the Titanic, was also a son of the city of Lichfield and a statue of Commander Smith can be found in one of the many park areas in the city. The birthplace and Infant School of Samuel Johnson. Authentic Tudor structures from the 16th century can be seen and are still in use today, 500 years later. Many fine examples of Georgian architecture can also be seen. And, to add to the charm, many of the streets are still following their medieval route of narrow, twisting and turning lanes. The Cathedral School, adjacent to the cathedral itself, is an imposing structure being used today as a co-educational day and boarding school. It traces its lineage to the 14th century when Lichfield Cathedral made provisions to educate its choristers. The Hospital (as in hospitality) of St John Baptist (below) was built in 1495 as an almshouse. It has provided shelter to the needy for over 800 years. Today it provides housing for senior citizens in need. 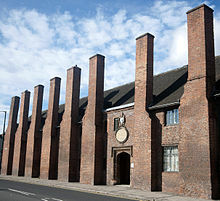 It is noted as one of the finest 15th century brick buildings in the UK. St. John's Chapel, built in 1135, houses a magnificent stained glass window by contemporary artist John Piper who died in the 1990s. St. John's Hospital is Lichfield's alms house and has sheltered those in need for over 800 years. Today it provides housing for seniors in need. It is noted for being one of the finest 15th century brick buildings in the UK. St. John's Chapel, built in 1135, houses a magnificent stained glass window by contemporary artist John Piper who died in the 1990s. However, charm or no charm we opted to eat in a small restaurant/coffee shop with more authentic period charm.